As a parent you either love them or hate them – soft toys that is. Despite my efforts to keep the population in our house from growing (and I do often wonder where all our soft toys actually came from) each of my children has one or two particular favourites. And I would be more than happy to let a few more cuddlies cross our threshold if they were created at Shidonni. Shidonni is an online design workshop where kids create their own one-of-a-kind soft toy and so much more. The process is easy – set up a free account, start creating, place an order and within a few weeks your finished product will arrive. No creation or request is too odd – the Shidonni team has seen it all from patchwork giraffe creatures to purple-winged strawberries. However the Shidonni experience is much more than simply designing a toy. Your child’s creature can become an animated character controlled on the site, making Shidonni half cyber sketchpad and half gaming zone. Shidonni moves away from the emphasis on ‘winning’ that many online games aimed at four- to ten-year-olds tend to focus on. Instead, the emphasis is on creative thinking. The process encourages children to develop their own creatures and virtual world where they can then interact with their drawings by caring, feeding, dressing and playing with them. 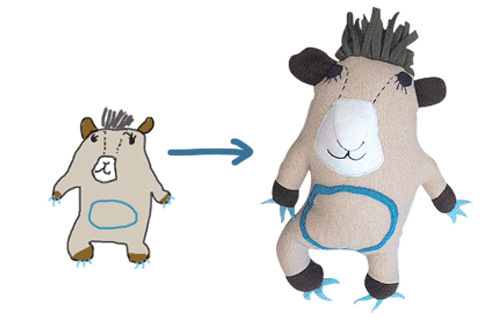 One-of-a-kind soft toys are US$79.99, which includes delivery and membership to Shidonni Pro, a more advanced creative zone which allows access to more design tools. However, it should be noted that all creative efforts are rewarded at Shidonni and with each creative activity additional design tools to enhance a child’s experience are made available.